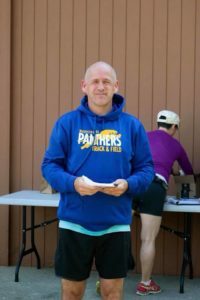 My name is Darryl Smith and I have been involved with track and cross country for the past 40 years as an athlete, coach, organiser, dad and administrator. My entire family runs and enjoys the thrill of competition. I have two amazing boys Elias and Gage and an amazing wife Sharleen. Running and competing go hand in hand for me as a coach and athlete. I run to compete and I compete so I can run. Its the physical challenges that I like as a runner. I want to push myself to go further and harder each time I run. Running has no barriers or limitations. We can run anywhere, at anytime and in any weather. The only limitations that truly exist for us, are the one’s we put on ourselves!